. . . is to hide them in this delicious dish with tart apples and smoky bacon! This recipe is based on a dish that my in-laws discovered at a tiny local restaurant here in North Georgia. The sweet and salty flavors are just wonderful together. 6 strips of lean bacon, whatever is your favorite. Heat a large skillet over medium heat and add bacon strips. Cook, turning once, until browned. Remove the bacon to a cutting board and slice into 1″ pieces. Reserve 2 tbsp of the bacon drippings and discard the rest. 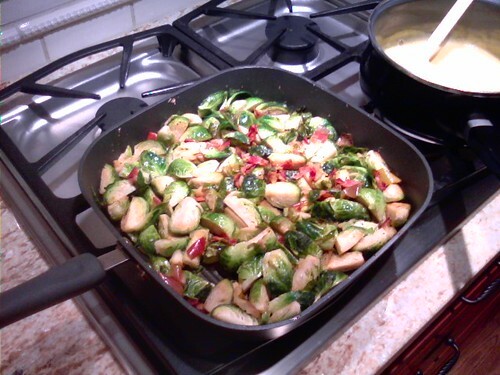 Add the olive oil to the bacon drippings in the large skillet and add brussels sprouts and apples. Season with salt and pepper. 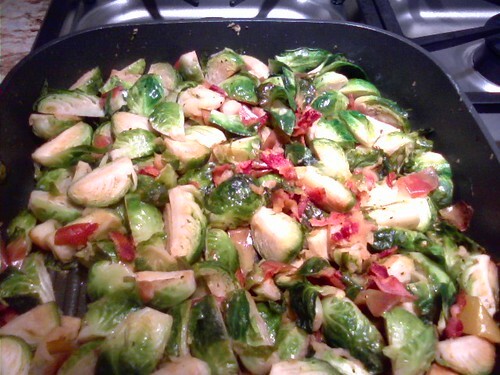 Cook over medium heat, stirring occasionally, about 10 minutes or until sprouts turn bright green and tender. Add bacon back to the skillet, and cook for 2 more minutes. Serve immediately, and enjoy!